Jannat Nazir new summer dresses 2013 was released recently. Just as its previous collection, this collection also offers casual wear, semi-formal wear and formal wear dresses. Long shirts as well as frocks can be seen in this collection of Jannat Nazir. Bold hues are visible in the collection. The clothes among Jannat Nazir new summer dresses 2013 are mostly eastern. However, these clothes have been made according to present fashion trends. There are clothes for all age groups but most of them are suitable for younger women. So, if you want clothes for any occasion this summer, check out Jannat Nazir new summer dresses 2013. We think that many women will like these lovely dresses. Jannat Nazir is a brand of Zahra Ahmad. It was formed last year. Due to its association with such a big brand and its stylish dresses, it has become really popular in a few months. It specializes in art wear. Luxury clothing is offered by Jannat Nazir for women. Casual wear, semi-formal wear and formal wear clothes are offered by Jannat Nazir. It provides traditional eastern wear clothes in each of its collections. For example, Jannat Nazir summer collection 2013 consisted of eastern wear. The clothes of Jannat Nazir are offered through its outlet in Lahore. 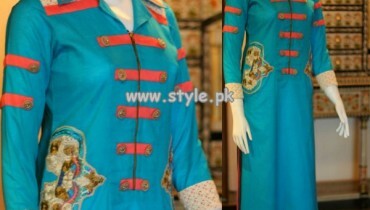 You can see pictures of the stylish clothes among Jannat Nazir new summer dresses 2013 for women here. If you like any of the dresses of Jannat Nazir new summer dresses 2013, you can buy them through the outlet of Jannat Nazir. The address of the outlet is given on the Facebook page of the brand. Details of the dresses are also given over there. So, for information, visit the Facebook fan page of Jannat Nazir. The address of the Facebook fan page of Jannat Nazir is given over here.